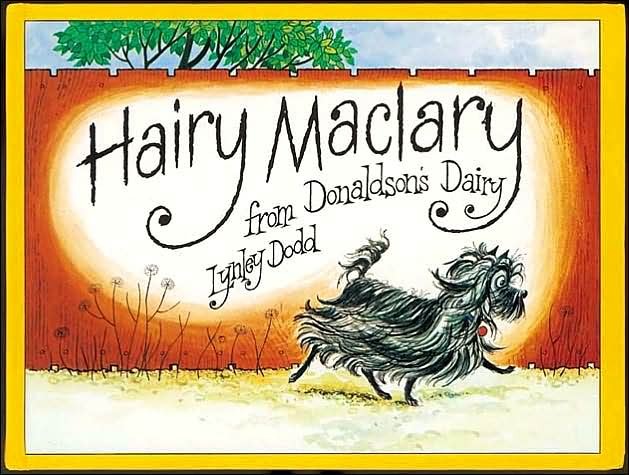 Hairy Maclary "from Donaldson’s Dairy" is going for a walk. With his little black eyes shining and his plumy tail aloft Hairy walks down the road. Soon he is joined by "Hercules Morse as big as a horse," who is a very large dog indeed. One by one more and more dogs join Hairy Maclary until there is a veritable procession following Hairy Maclary down the street. The dogs come in all shaped and sizes, spotted and furry, long legs and short ones. On this canine group go with heads head high until they meet a foe greater and more fearsome than all of the dogs put together. Hairy Maclary and his friends meet Scarface Claw "the toughest Tom in town." Now what will the brave dogs do? Deliciously funny names, wonderful illustrations, a simple rhyming text, and a wonderful ending make this a winning picture book for any child who loves animals.